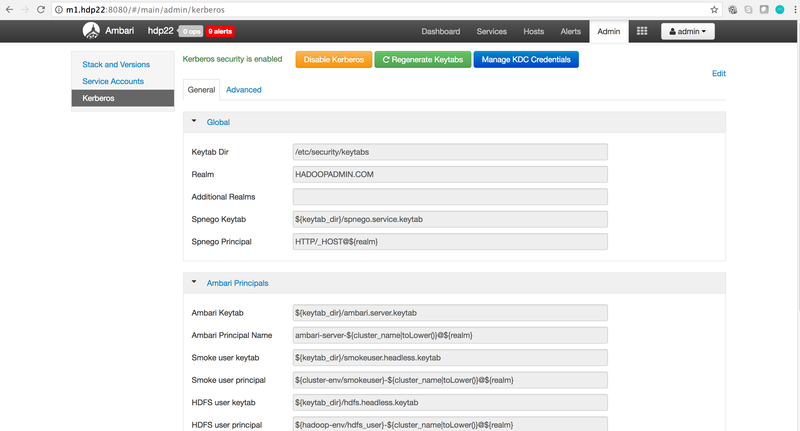 Sometime you want to disable kerberos via ambari then this article will help you to do your job in few steps. Log in to Ambari Web and Browse to Admin > Kerberos and Click Disable Kerberos to launch the wizard. You will see some warning msg, so click ok and goto next. It will redirect you to Disable Security page and will ask you to enter admin principle username and password. Complete the wizard and now if you will goto the Ambari Web and Browse to Admin > Kerberos then you will not see kerberos parameters and will ask you to enabled it again. Please feel free to give your valuable feedback or suggestions. Hi Thanks for your articles.They give a great insight on Hadoop. Currently we have kerberos enabled in our cluster using IPA free.We want to migrate it to Microsoft AD kerberos. So,we are planning to disable kerberos and then enable it using the microsoft AD.I would like to know if there would be any impact on the existing services because of this.Also do you have any detailed documentation for migrating from MIT kerberos to AD kerberos ? If you disabled kerberos via ambari and removed SPNEGO from all services where you have configured then it should not be any problem by setting it up with MS AD. But if you face any problem then feel free to let me know, I will be always here to help you. sure wil try and let you know.Thanks for your immediate response.Really appreciate it.